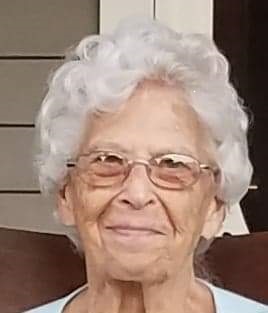 Obituary Notice for Neva Georgene (Norton) Hartford | Pepper Funeral Homes & Cremation Facility, Inc.
Neva Hartford, 87, of Shunk, PA, passed away April 1, 2019 at Olean General Hospital in New York state, surrounded by loved ones. Neva Georgene was born November 10, 1931 in Lycoming county at her grandparent's farmstead in Cabbage Hollow. She was the eldest of fourteen children of the late Harvey "Bub" and Rachel (Tule) Norton. Early on, Neva was a caretaker of children, starting with her own siblings while working on the family's farmstead. When she was 12 years old, she began spending summers with local families, earning wages while taking care of their homes and children. As a teen, she was a waitress in Laporte and she would have furthered her education after high school but instead, selflessly offered her savings to her parents who were in need at the time. Neva worked as a seamstress in Dushore and retired as Housekeeping Supervisor for Dar-Way Nursing Home. Throughout Neva's life she always worked, maintained the family's farm, and raised children. She continued family traditions of gardening, canning, quilting, and crocheting. When told she was the hardest working woman in the family, she protested stating her mother, Rachel, held that title. Neva was always happiest with a baby in her arms and she was afforded that opportunity many times as she was a cherished grandmother to 16 grandchildren, 36 great grandchildren, and 11 great-great grandchildren. Neva enjoyed sharing stories of her youth with her grandkids, always expressing amazement at the advancements she'd seen over her lifetime, especially since she "grew up in the horse and buggy days." Neva was a proud wife of a Navy veteran. She married her sweetheart and best friend, Lawrence Edward Hartford, February 6, 1950. Their marriage was a true partnership. They built their home together and shared 63 years of wedded bliss before Lawrence's passing in 2013. Neva was preceded in death by her four sons, Marty, Larry, Kent Sr. "Bucky", and Rocky Hartford; great grandson, Mason Millard; grandson, Jeremiah Hartford; grandson-in-law, Scott Jennings; her sisters, Eileen (Miles) Henry, Iva Ayers, Margorie (Charles) Heath; mother-in-law, Lila (Leonard) Hartford; father-in-law, James S. Hartford; brothers-in-law, Bernardo DeLellis, Lowell Allan "Punk" Williams, Dale, Dean, Earl, Glen, James, Reed, and Robert Hartford; and sisters-in-law, Marjorie Hartford Hickok and Minnie Norton. Neva is survived by her daughter and son-in-law, Cheryl and Marlin Norton; her daughters-in-law, Peg (Rocky) and Rosa (Kent Sr.) Hartford; her brothers, Darrel, Galen, Hal (Sharon), Malyn (Dottie), and Max Norton; her sisters, Arla (Roger) Pepper, Artist (Burr) Snell, Marcele (Steve) Clark, Rheda (Larry) Baumunk, and Rhoda DeLellis; her brothers-in-law, Earl Ayers and Harland (Connie) Hartford; her sisters-in-law, Brenda Hartford Higley, Delores, Janice, and Mary Hartford; her grandchildren, great grandchildren, great-great grandchildren, numerous nieces, nephews, cousins, neighbors, and friends. Calling hours are 10 am until noon, Saturday, April 6, 2019 at Pepper Funeral Home, 578 Springbrook Drive in Canton. The funeral and committal services will be held at 12 pm with Pastor Bill Hargenrader officiating. Burial will follow in West Hill Cemetery, Shunk, PA.